If you keep up with technology the term “cloud computing” seems to have been one of the most hyped technologies of 2010/2011. The interesting thing is that had you been watching cloud technology for the previous several years, you’d have seen it coming. According to the world’s leading information technology research and advisory company, Gartner, every emerging technology follows what is called a “hype cycle.” The hype cycle follows a new technology from early adoption through its growth to where it reaches “mass media hype.” After that comes some disappointment as the bloom comes off the rose and the media walks back some of its previous puffery. Then after a steep decline in hype, when about 5% of the potential audience has finally fully adopted the technology, a bit of media buzz comes back as they see the solid commercial growth of a mature technology. 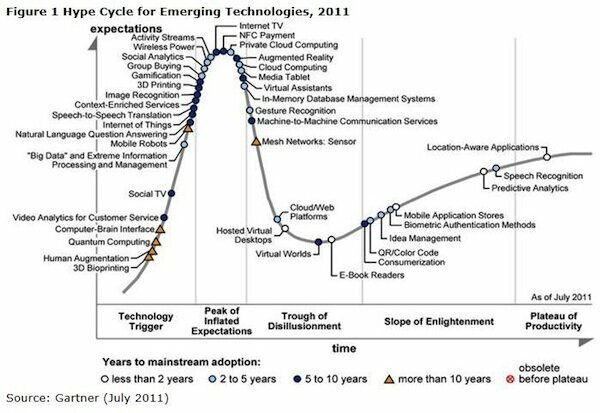 The Hype Cycle of Emerging Technologies 2011. Source Gartner. 3D Printing first appeared on their chart in 2008, at a position not much lower on the chart than they are now. It was initially placed just above cloud computing at the time, which has now in 2011 already gone over the top, leaving 3D printing pretty much where it began four years ago. 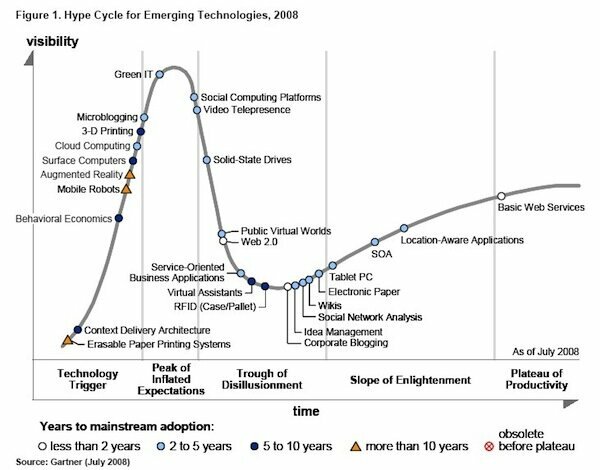 While it’s true that 3D printing is just barely starting to get mainstream press, it’s actually considerably past the first adopter phase. Gartner must be using the term 3D printing to describe hobbyist 3D printing, not commercial 3D printing used for rapid prototyping — the latter is well beyond early adopter stage. Regardless of its definition, it’s on the chart, and will be interesting to watch the progression. Given what I’ve seen in even just the past month alone, the non-technical media is really picking up on 3D printing. I think within another year or two, we’ll see an incredible amount of hype (warranted, we feel, of course) about 3D printers. This is not an article about profiting from the hype, but if you followed cloud computing in the stock market, you know how well you could have done investing in cloud computing stocks (assuming you knew when to get out — at the height of the hype). The same thing will likely be true of 3D printing stocks, and if you are interested in which companies you are able to invest in, see my article here called, Investing in 3D printing Stocks. Having the media focus attention on 3D printers is fabulous. It draws people to hobbyist 3D printers and investors to 3D printing companies. But hype or no hype, the technology is permanent and indeed world changing. Take a look at could computing again — the type is dying now, but the technology is flourishing and becoming the new standard of storage; similarly 3D printing will continue to grow solidly through the hype phase, and install itself as the disruptive manufacturing technology of the 21st century, changing the industrial process as we know it. We’ve also included Gartner’s 2008, 2009 and 2010 Hype Cycles below for your comparison. Looking at the positions of 3D printing in the charts, Gartner hasn’t measured much hype growth since 2008. But given recent media attention, we’re thinking 2012 will be much different as the media continues to be wowed by the magic of printing in three dimensions, at lower and lower costs.